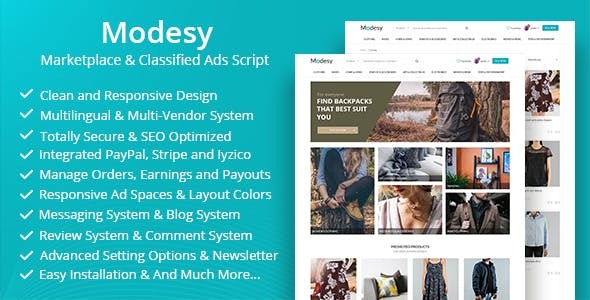 Modesy is an online store script where you can sell and buy used products. It has a clean, responsive and user friendly solution. You can manage almost everything on your site using the powerful admin panel. It is safe, optimized for SEO, fast, fully customizable and easy to use. Built using Bootstrap 4, fully protected system, 10 color layouts, multilingual system (any language can be easily added), editable and sortable navigation (from the mega menu), responsive and sortable slider (with the ability to show and hide), advanced products with the ability to turn on and off), product location map, payment gateways, PayPal / Stirpe / credit card, filter and sorting and more.